Save the date! 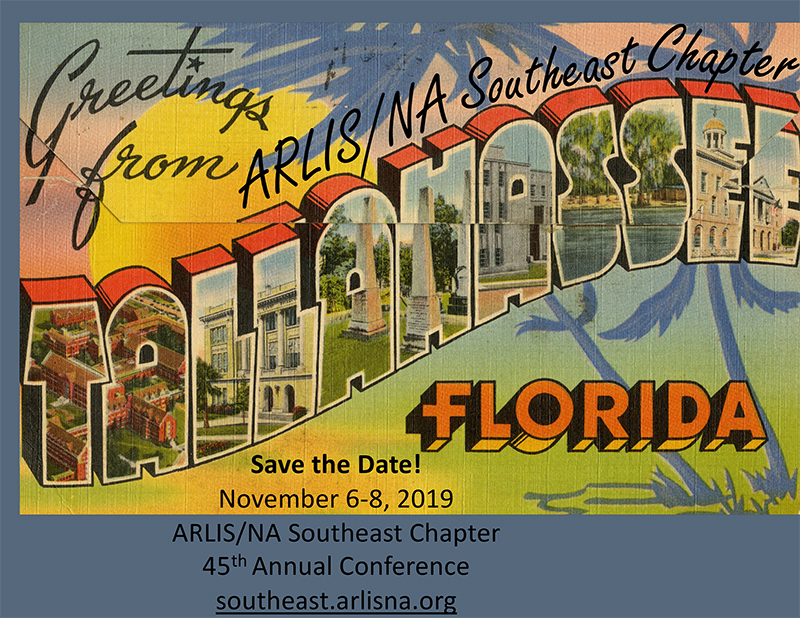 The ARLIS/NA Southeast Chapter is pleased to announce our annual meeting from November 6-8th in Tallahassee, Florida! Join us for a full program of presentations and activities throughout the city, in addition to our regular chapter business meeting. We are also happy to announce that Florida State University’s Robert Manning Strozier Library will be our home base. More information about the conference program and registration is forthcoming, as well as a call for presentations and on-site volunteers. Our conference hotel is the nearby Four Points by Sheraton Tallahassee Downtown. Please use this link by 5pm on October 16th to book at the discounted conference hotel rate of $119 per night (rate applies 11/6 through 11/9). We look forward to seeing you in Tallahassee this fall! Apply now for the 2019 Professional Development Travel Award! Register now for Richmond 2018!